TEL AVIV (Reuters) - Israeli Prime Minister Benjamin Netanyahu's wife, Sara, offered sympathetic words to visiting U.S. President Donald Trump and his wife Melania on Monday, telling them that people still loved them despite negative media coverage. 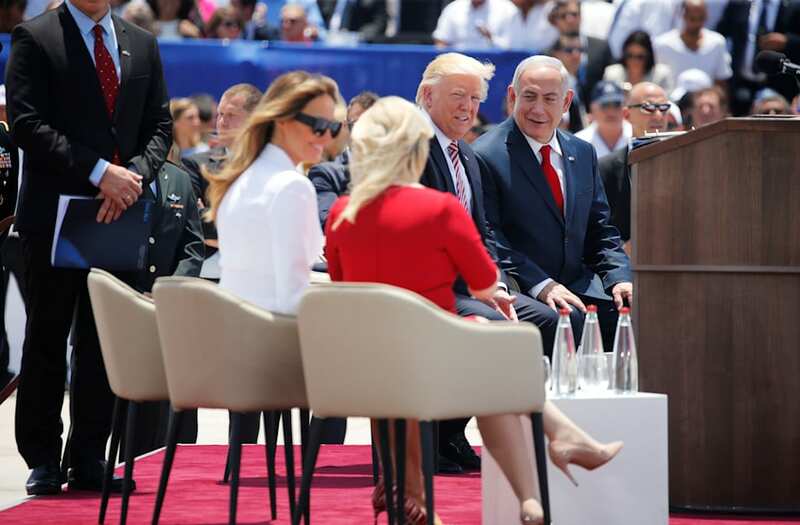 Standing on the red carpet and chatting minutes after Trump and the First Lady had arrived at Tel Aviv's Ben Gurion airport in Air Force One, Sara Netanyahu was caught on camera exchanging a few private words with the visitors. "The majority of the people of Israel, unlike the media, they love us, so we tell them how you are great and they love you," Sara said to Trump and his wife. Trump then interjected: "We have something very much in common." Trump's presidency has received widespread negative coverage in the U.S. and international media, not least over his firing of FBI director James Comey and amid an investigation into ties between his administration and Russia. In Israel on the second leg of his first overseas trip since entering office, Trump is to hold talks separately with Netanyahu and Palestinian President Mahmoud Abbas in a stopover lasting barely 28 hours. Speaking over the noise of the president's jet, Sara Netanyahu added: "I talk every place about how great you are," she said, and Netanyahu backed her up saying: "I can testify to that." Netanyahu and his wife have a tense relationship with the Israeli media, which they have both described as biased against them. In January, Netanyahu described the media as "left-wing" and "Bolshevik" and said they were out to bring him down. Testifying in a libel suit the Netanyahus filed against an Israeli journalist, Sara Netanyahu told the court: "Everything that is published about me, it's all lies, evil lies that bear no connection with who I really am ... The media uses me as a tool to try and topple the prime minister." Sara's red-carpet conversation soon began circulating on social media, along with another awkward arrival moment. As the Netanyahus strode along holding hands, as they often do, Trump, walking alongside them, reached out to grasp the First Lady's hand, but video circulated on Twitter appeared to show Melania Trump briefly flicking his hand away.